There are many Nigeria banks that offer domiciliary account services. Such banks include Guaranty Trust Bank (GTBANK), Diamond bank, Firstbank of Nigeria, UBA, Zenith bank, Stanbic bank, etc. Do you need domiciliary account? 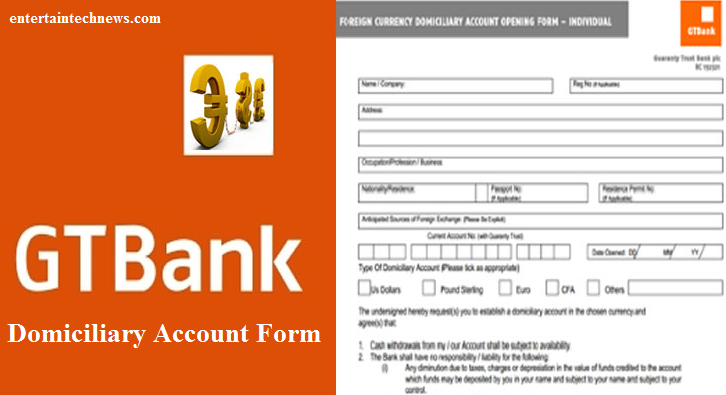 Do you want know how you can open domiciliary bank account in Nigeria with Guaranty Trust Bank (GTBank)? In this post, I will show you how to open domiciliary account with GTBank within 48-72hours. But before I go into details of showing you how to open domiciliary account with GTbanks, you need to understand what domiciliary account is and what it is use for. I have shared full details of all you need to know about Domiciliary Account, please click here to read it now before you proceed. If you have done that, please proceed to next level. Note: It is not usually easy to transfer money from Nigeria to a recipient abroad because many Nigeria banks are still only on the inbound money transfer services guideline of Central Bank of Nigeria (CBN). However, I have a good now for you. One easy way of transferring or sending money from Nigeria to a recipient abroad is through domiciliary account money transfer. You can easily transfer money from one domiciliary account to another either through internet banking or by stand order transaction. It can even be done through mobile banking. The account facilitates international business transaction. What are the Things You Need To Open GTBank Domiciliary Account in Nigeria? It is quite easy to open, especially when you have account already with Gtbank. Below are the things you will need to Open GTB Domiciliary Account in Nigeria. Two(2) references who are current account holders in any bank in Nigeria, preferably Gtbank users. But if you could not, just look for any Bank Current Account Holder. Many Banks in Nigeria require Minimum Opening funds in Foreign currency e.g. USD, GBP or Euro. It can be at least $150. Gtbank is quite different from other banks because you can Open a Domiciliary Account free at GTB but you have any existing account with them i.e you must have account with the bank. So, if you are into international business or you want send money from Nigeria to your family member, relative or friend abroad; you need to have or open a domiciliary account. Domiciliary account is an alternative to PayPal account. 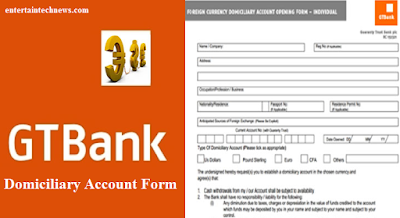 Below are steps on how to open GTBank Domiciliary Account in Nigeria. - Visit nearest Gtbank branch near you. - Request to open a domiciliary or foreign currency account from their customer care. - You will need to go with Form, in order to get two Current Account referee holder. - An account will be opened after about 3 to 5 working days. - The Bank will send your Domiciliary Account Number to you, either through SMS or by Mailing it to your Email. After that, you can start using the domiciliary bank account for receiving, saving or making payments in foreign currencies.